Poodleism: Am I really that obsessed? 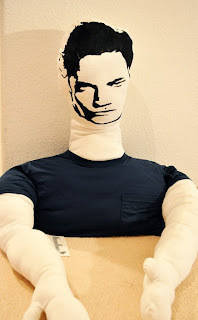 Today three different friends have alerted me to the fact that a Robert Pattinson/Edward Cullen life-size pillow doll now exists. While I love me some Edward Cullen in an admittedly too teenager-ish way, do you people really think that lowly of me? I think this doll is absolutely giggle-tastic, I have a real manfriend of my own and need nothing of the sor t thank you very much. Altough, I'm not going to lie to you, If I were in the market for a life-size look-a-like to snuggle up with, this could be it. So I don't know if I'll take this as a sign that I've gotten too crazed with Edward fever or my friends just know me that well. Could be a little of both. 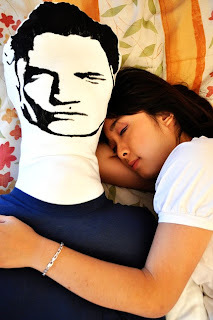 I've just attempted to find some other doll replicas of steamy men that I heart. (As a sidenote: if you Google "life size man doll" with the best of intentions for your blog, you get some weird things.) I couldn't really find anything else in the life-size category. There were action figures galore. Boring. Anyway, for sending me the Edward doll information...thanks?